For catering the variegated demands of our respected clients, we are highly engrossed in providing a wide range of Tsugami Sliding Head CNC Machine. 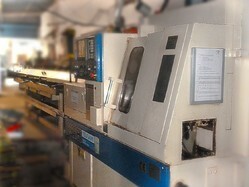 Used CNC sliding Head Machines in Various sizes - 12, 16, 20.25, 32 with Automatic bar feeder, Fanuc system. We can prove out the components and also supply tooled up machines. By keeping track of the current market needs, we are engaged in manufacturing an excellent quality range of Spindle Sliding Head Machine. The Manurhin sliding headstock has a stroke of 410 mm; this advantage enables the machine to produce much longer parts than ordinary swiss type lathes. Machines are configured to machine bar material from brass, aluminium or stainless steel from round, square or hexagon. High precision CNC Swiss Type machines from South Korea with Flexible tool layout with Best in Industry application support. 1. Complete high grade cost iron structure with head and rotatory base. 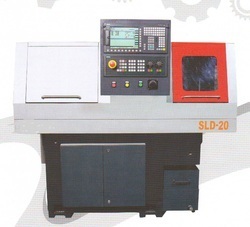 Sri Yantra Engineering Agencies (P) Ltd offers Swiss type Sliding Head – CNC Automatic Lathes – made in Korea.